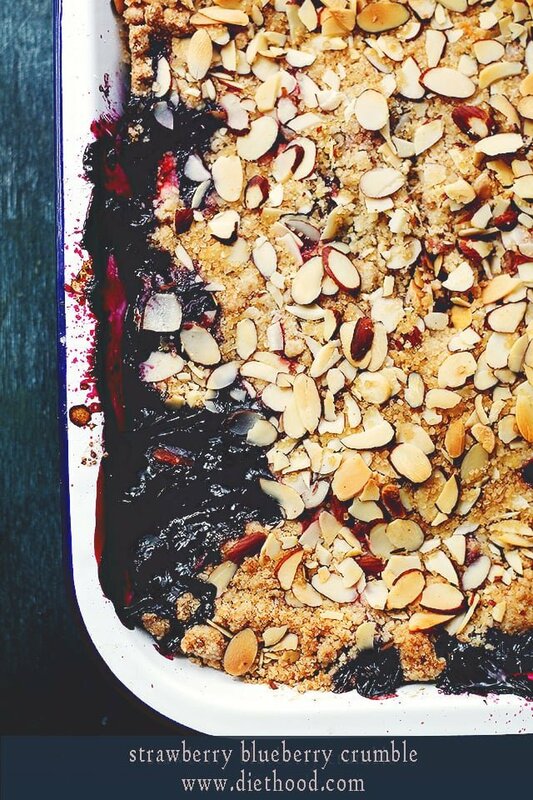 Strawberry Blueberry Crumble, a.k.a. the lazy man’s pie, a.k.a. my favorite dessert, a.k.a. strawberries and blueberries baked with a delicious, crunchy topping of sugar, flour, butter and almonds! Hi, you guys! Happy Monday! I feel like I ran a marathon. I mentioned a little birthday party (35+ guests) we were having for our 2-year old yesterday… We had the best time! Friends, food, laughter, drinks, screaming kids… life is good. BUT this Mama is tiiiiiiiired! I feel old. And I’m pretty sure that’s when grandma goes to bed, which proves that I AM getting older. Also? Remember when we could shop at Forever 21 and put together an outfit for about $21 bucks?! FUN! I tried doing that few days ago and, um, a dish rag covers more of my bottom than their skirts and shorts. By the way, I hate shorts. The last time I wore shorts, I was about 12 years old. You know, before the thighs decided to become one. Which was praaaaahbably before I learned that I could eat the entire Strawberry Blueberry Crumble, straight from the pan. Once upon a time, I opened up a cookbook, filled with Southern recipes and it changed my life. Southerners make the best-est food on the planet. Desserts, especially. HELLO Pecan Pie! And Strawberry Shortcakes. Or how about something along the lines of this Skillet-Baked Peach and Cherry Cobbler… o.m.g. SO GOOD! Then I learned about the Southern version of lazy pies, a.k.a. a Crumble, and life got even bettah! If you don’t think this looks like the best and sweetest treat that arrived from the heavens, then I don’t know what to do for ya. I can’t help you there. 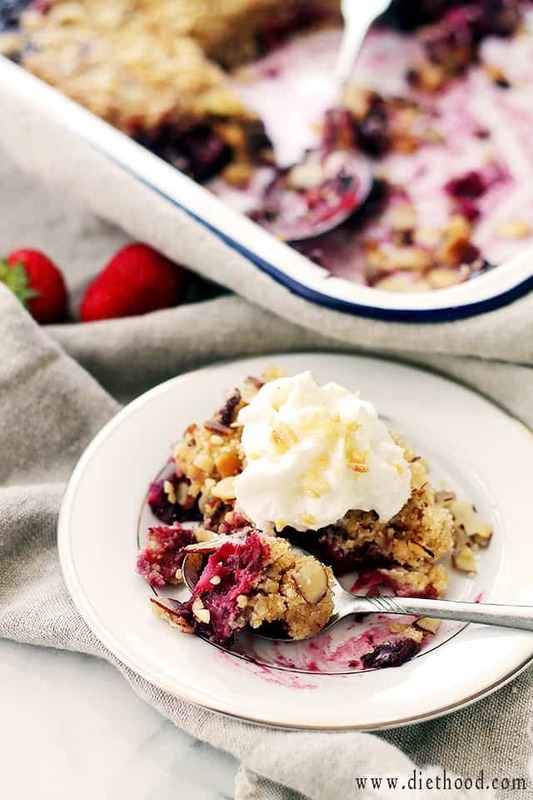 Nothing more than berries baked with a crunchy topping of sugar, flour, butter and almonds, this crumble will certainly satisfy your pie-cravings during the lazy summer days. Add a big dollop of vanilla ice cream or whipped cream and eat.it.UP! Strawberries and Blueberries baked with a delicious, crunchy topping of sugar, flour, butter and almonds. In a 9-inch pie plate, or a baking dish, combine strawberries, blueberries, lemon juice, sugar, cornstarch and salt; let stand 10 minutes. In a small mixing bowl combine flour, baking powder, sugars, lemon zest, and melted butter. Mix with wooden spoon until crumbly. Add the prepared topping over the fruit mixture. 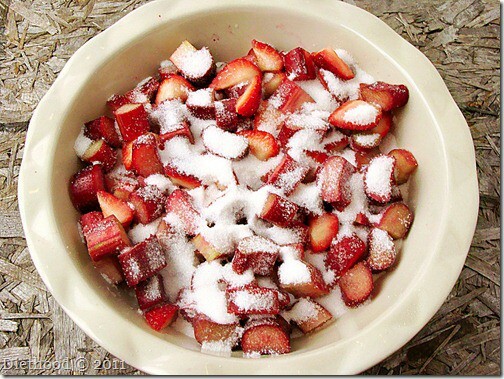 Sprinkle sliced almonds and raw sugar over topping. Place the pie plate/baking dish on previously prepared baking sheet. Bake for 40 to 45 minutes, or until the topping is golden brown and the fruit is bubbly. Serve with a dollop of ice cream or whipped cream. Love your ideas..gonna try this, how many servings do you typically get? What exactly is a “clamshell” of blueberries & strawberries? Do you mean a pint, a quart? It holds exactly 1-pound of strawberries. The other clamshell hods 12-ounces of blueberries. I am LOVING these photos and the recipe. Oh my gosh do I wish this was sitting in front of me right now. Well done!! I want the whole pan of this right now! The end. You can never ever go wrong with a crumble!! It’s one of my all time favorites, too! This is sure to be a winner! 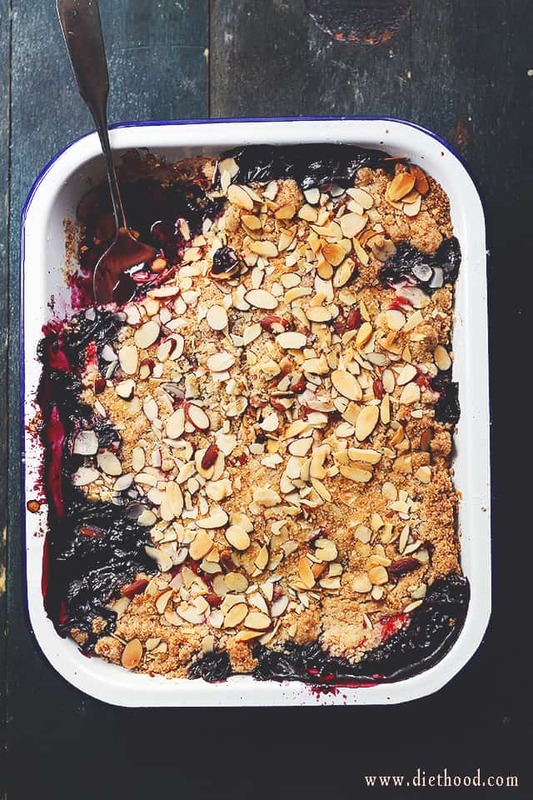 Mmmmm….I want this crumble for breakfast! Love the color! I love fruit crumbles! Yours is beautiful! 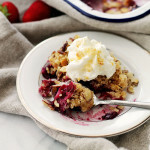 Nothing beats a berry crumble in the summer time! I’m all about cheating on pie with crumble. The other day the hubs and I went out for a few drinkie poos (turned par-tay) and it took me all day to recuperate. I feel your pain. Love this. Pinned. When I think of someone who does know how to cook both savory and sweets…it’s you! Your family is so lucky! I love the crumb topping. I would secretly scrape some of my kids’ and husband’s portion into mine. Muahahaha! Oh yum! I love fruit crumbles and the berry combination is the best. I swear I can read your posts all day long. Not only for the food, but your writing talent. Cracks me up! Anyway, love this pie, all of my summer favs in one mess together. So great! Wow! Look at that bloody color! Looks so tempting! Great that it’s an easy recipe to make! And who says you are getting older? Moms never age. You know this, right? They just feel tired sometimes. I just want a spoon and the whole pan! 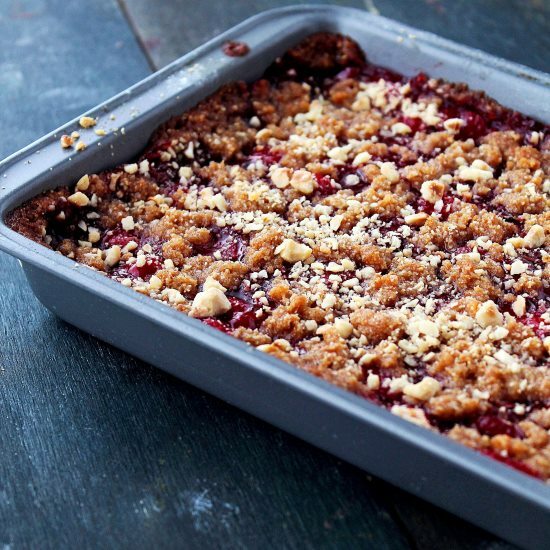 Love this gorgeous crumble, Kate!! 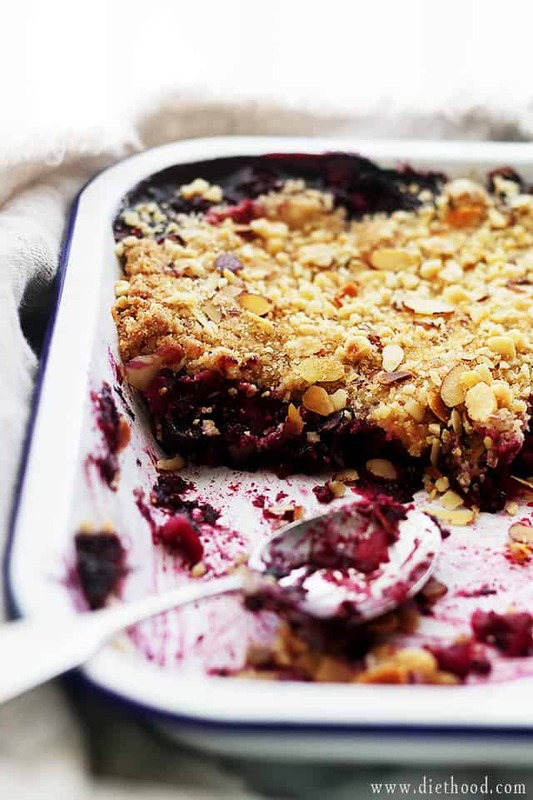 Does crumble count as lunch? Because I need this, now! Great post! The recipe looks amazing! I know the grandma feeling very well… And 35 guests is a lot! Hopefully you were able to enjoy it a little too? YES! That crumb topping is be.yond! 🙂 THANK YOU! !